Is your garage in need of some attention? 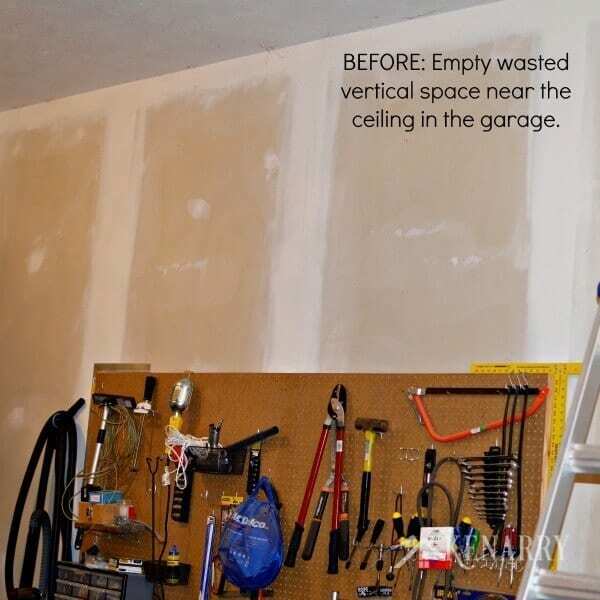 These ceiling mounted shelves are an afternoon DIY garage storage project you will be so glad you completed. As fall gives way to winter, our attention has turned toward neglected indoor projects. These are the projects we all tend to put off when the weather is nice and we’d rather be outside. It’s easy to procrastinate on projects like garage clean-up, hanging pictures, and repainting rooms. One of those neglected projects on our list was finding a way to improve the storage and organization in the garage. Thanks to the BLACK+DECKER “Your Big Finish” initiative, we finally found the motivation to get our garage storage figured out! Disclosure: Many thanks to BLACK+DECKER for sponsoring today’s story and inspiring us to finish this project! 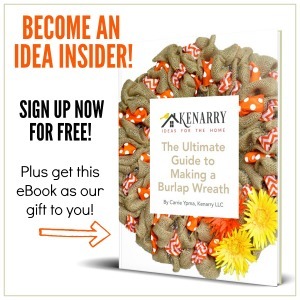 Campaigns like this help us keep the great ideas for the home coming your way. All ideas and opinions expressed are our own, derived from our personal experience. For many of us, floor space in the garage is at a premium. As Carrie and I started bringing everything indoors for winter, we needed a solution that utilized vertical space. 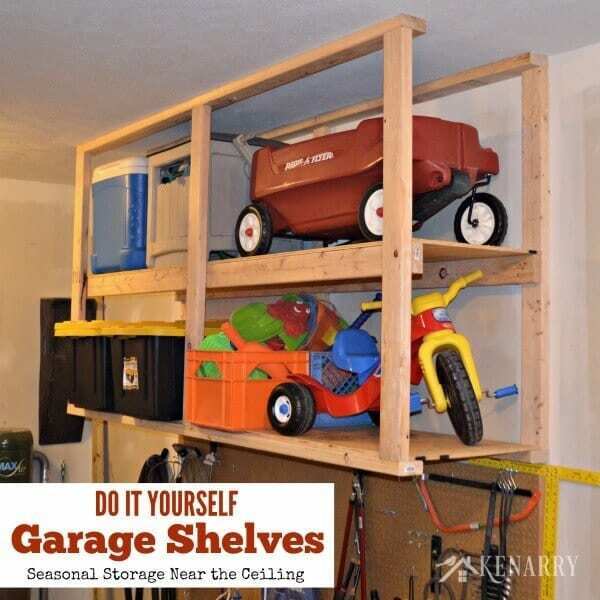 Our final DIY garage storage solution was a simple ceiling suspended two-tier shelving system that allowed us to reclaim garage floor space by storing seasonal items up and out of the way. 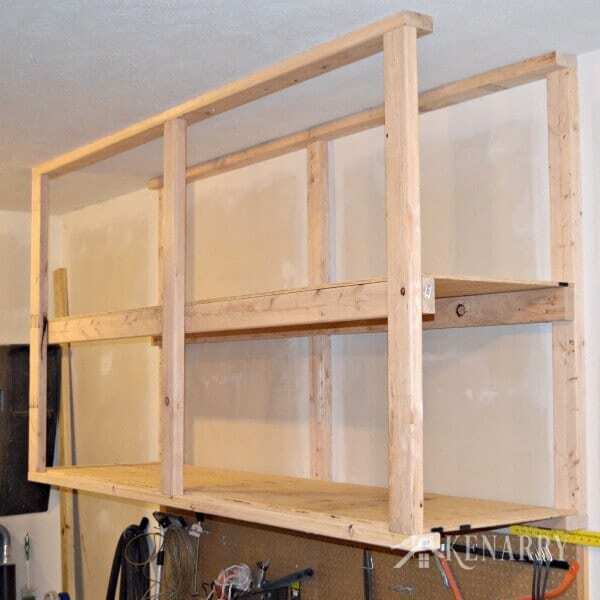 I wanted to create a DIY garage storage shelf design that was low cost, required minimal cutting, sturdy, safe, and could be put up in an afternoon. To achieve all of this I decided on a 8 ft. span that is 4 ft. high and 24 in. deep with a shelf on the bottom and one in the middle. Using these dimensions maximizes your lumber utilization to minimize costs and fits a lot of common storage totes well. The 24 in. shelf depth also matched the standard spacing of my ceiling joists. It’s critical that the shelving system is securely fastened to a joist in the ceiling to make sure it stays up when you load it up! I chose a space above my workbench to create my shelving. Okay, let’s get this project started! 1. Prepare the studs for rail assembly. 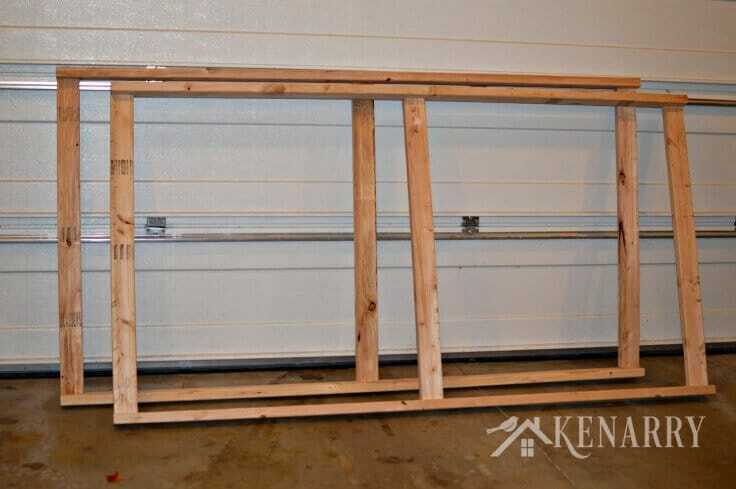 Each rail will consist of two 8 ft. studs and three 4 ft. studs. 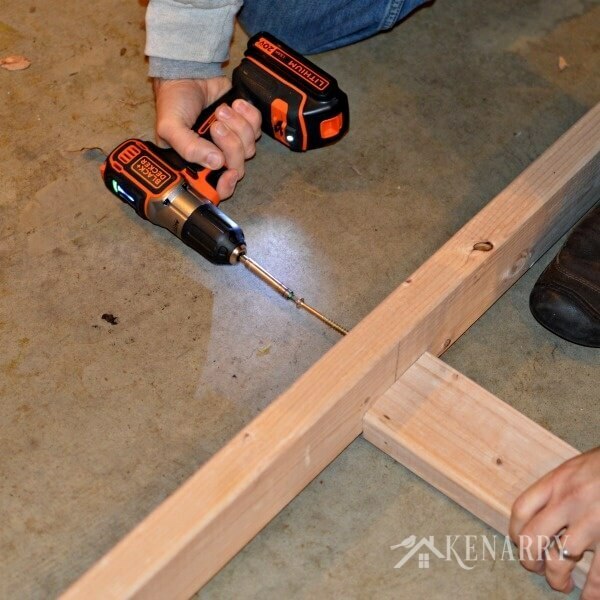 The first thing to do is mark the center point on three of the 8 ft. studs and cut them in half with your saw. You should now have 6 half-studs. The exact measurement of these studs is not as critical as having them all be the same length. Don’t forget to compensate for blade thickness when you determine the center cut or you’ll end up with uneven studs. To recap, you should now have six 4 ft. studs and six 8 ft. studs. One last thing to check is that your studs are all the same length. Cut them to 8 ft. if they are oversize. 2. Assemble the rails. This step is pretty straightforward as each rail consist of two 8 ft. studs connected by the three 4 ft. studs. The only tricky part here is that the connector studs are turned 90 degrees. Take a good look at the pictures prior to assembly. 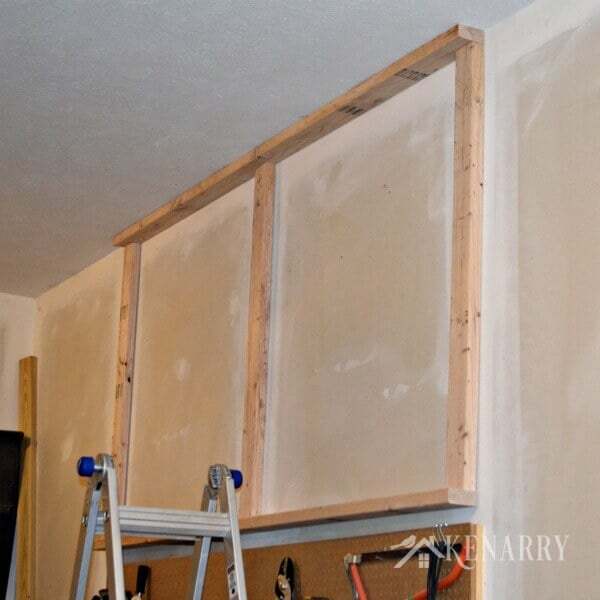 Attach the 4 ft. studs at each end of the 8 ft. stud and then attach the last 4 ft. stud in the middle. Use the #10 x 3-1/2 in. screws to secure the frame together. Finally, attach the bottom 8 ft. stud to complete the rail assembly. Repeat the process for the second rail assembly. When complete you’ll have two identical rail frames. 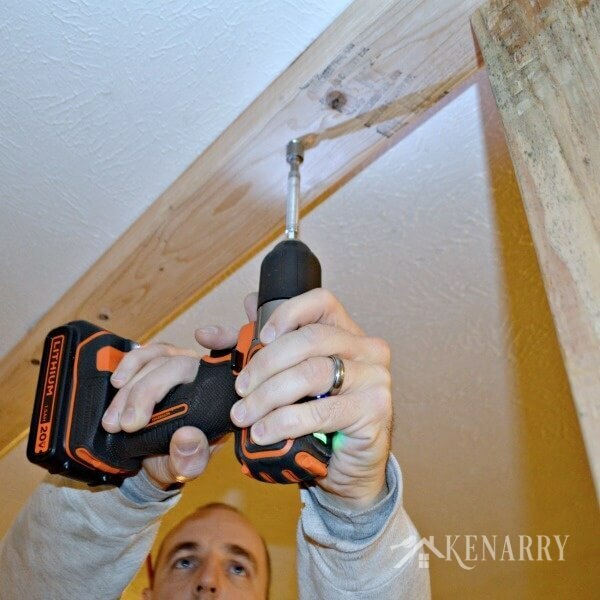 Do not attach the middle rail yet, you’ll do this after the rails are hung from the ceiling. While you could do it at this point, waiting will make it easier to handle the rails as you’re bolting them to the ceiling. The picture below shows my two completed rails. 3. Hang the back rail. This is a two person job. Carrie and I were able to manage it with a couple of ladders. The first thing you’ll need to do is verify that you have a stud in the ceiling at the ceiling-wall corner that you can bolt into. 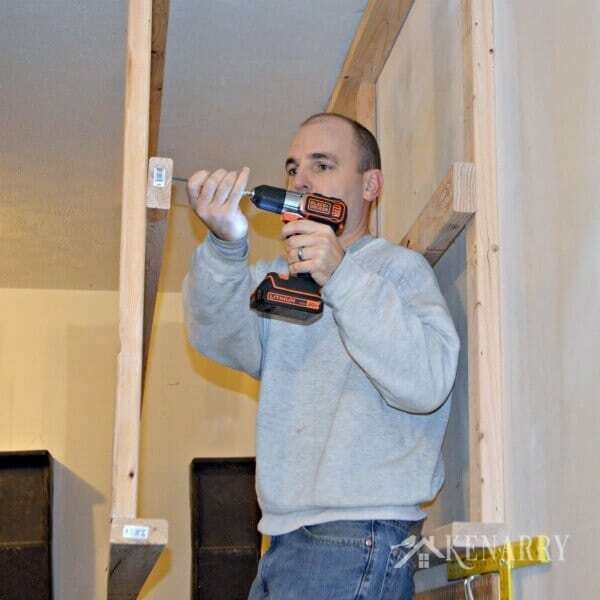 The good news is that most builders will have a stud in place for the drywall. Once you’ve verified the stud is there, mark the edge location where you want the shelving to go on the wall. 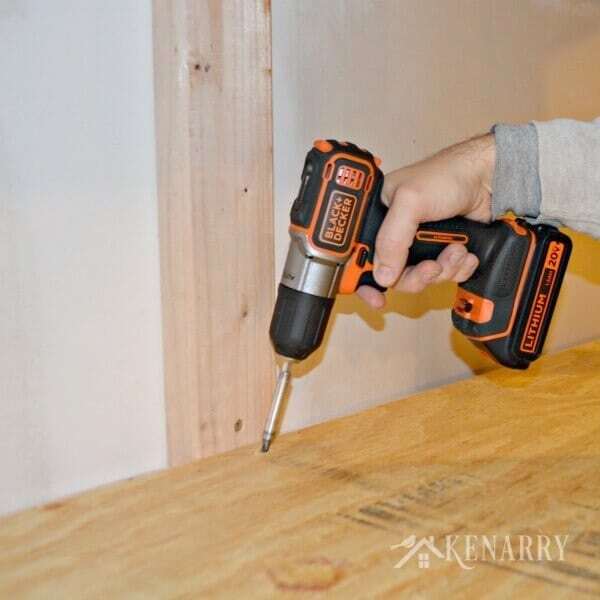 Make sure the edge matches up with the edge of a wall stud so you can screw the frame into the wall stud in the next step. Next, lift one of the frame members up tight against the ceiling and the wall. Once you have it in place, use the lag screws to secure it to the ceiling. I used four lags for the 8 ft. stud. I chose to use lags that did not require pre-drilling. Depending on your lag screw you may need to drill a pilot hole. 4. Attach the front rail to the ceiling. It’s absolutely critical that you line up the front rail with a ceiling stud. Once you’ve got the exact measurement (23-1/4 in. for me – MEASURE CAREFULLY! ), use a square to mark where the edge of the front rail will go on the ceiling, lining it up with the edge of the back rail. 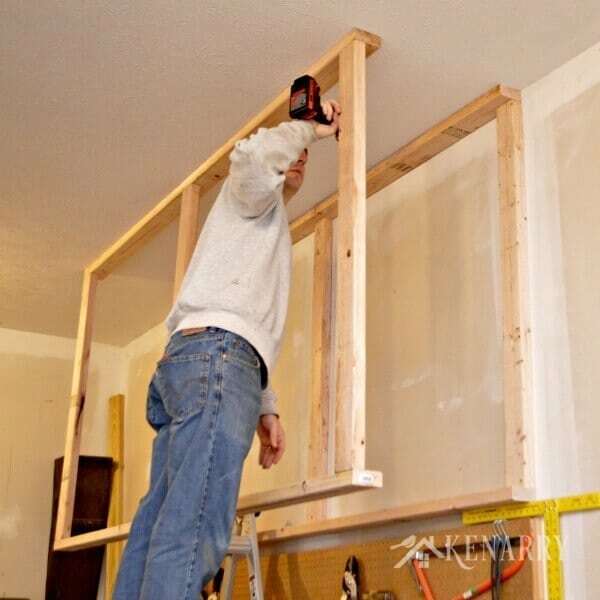 Now you’re ready to lift up the second frame rail and use the lag screws to secure it to the ceiling. Orient the front rail so the “L” points back toward the wall. MAKE SURE YOU HIT THE STUD WITH YOUR LAG SCREWS! 5. Attach the top shelf support studs. Take one of the two remaining 8 ft. studs and attach it onto the back rail. Make sure it’s level. This will set the height of your top shelf, so set it to your personal preference. I chose to roughly center it. Use a couple of the 3-1/2 in. screws each place the support stud intersects the vertical 4 ft. studs. 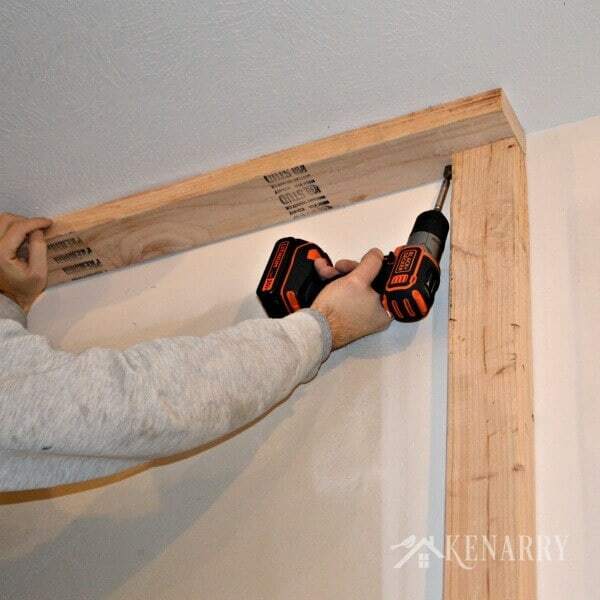 Next, repeat the step to attach the shelf support stud to the front rail – use #8 x 2-1/2 in. screws for the front support stud or the screw will poke out the back of the front rail. 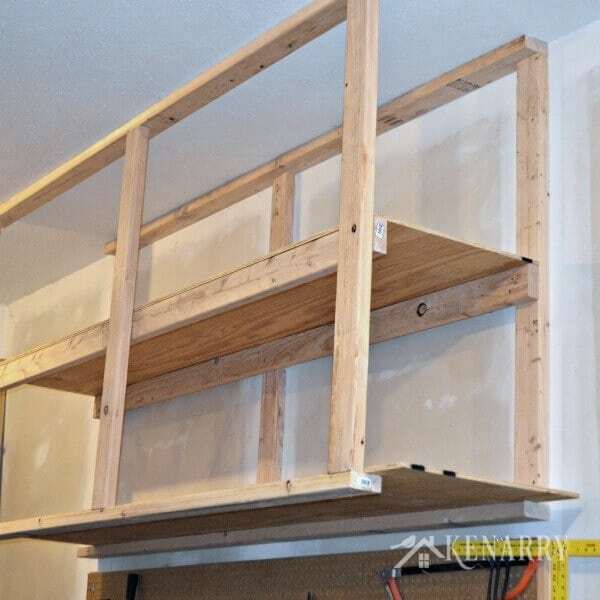 Make sure you use the same height as you had on the back rail so the shelf is level. 6. Cut the shelves. 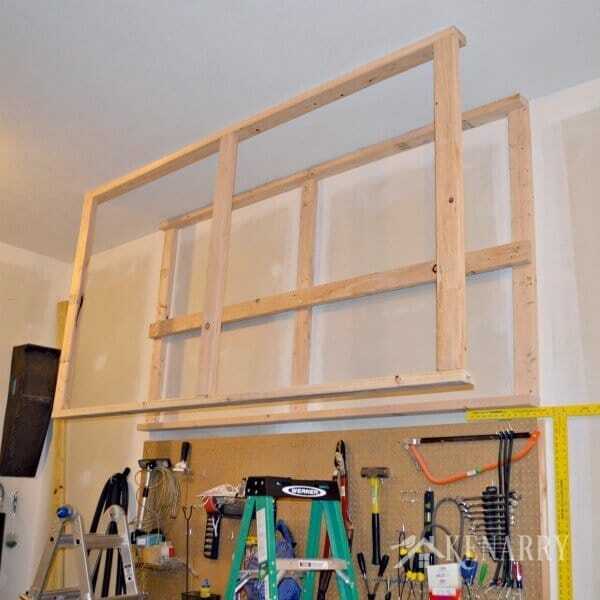 The first thing you need to do is measure the width of the DIY garage storage shelves you’ll need to slide down the rail system that you made. Once you have that number use your table saw or circular saw to cut two 8 ft. long shelves to the proper width for your unit. 7. Install the shelves. Now slide the shelves into position. Align the ends of the rails and plywood. Screw the plywood to the rails to hold the DIY garage storage shelves in place. Repeat the process for installing the second shelf. 8. Store your stuff. 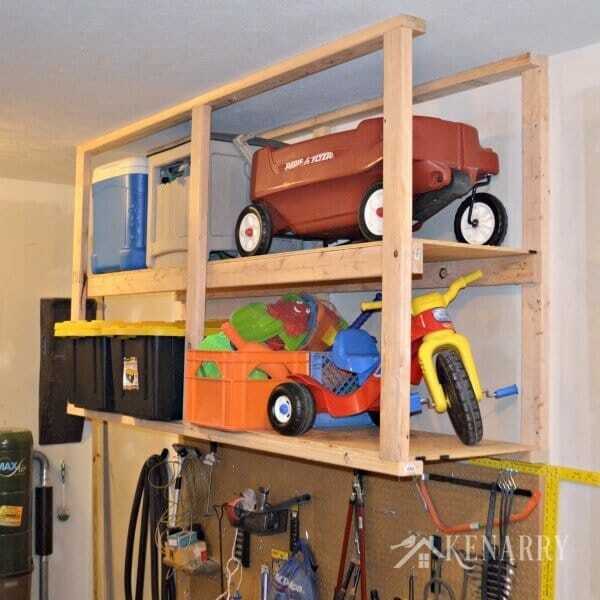 Congratulations, you’ve just created some great, out of the way garage storage. Now fill it up and enjoy your organized garage! 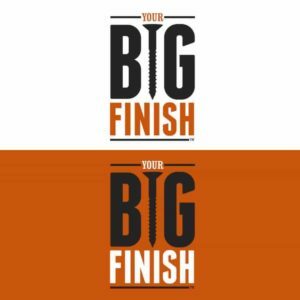 I hope you enjoyed our DIY Garage Storage solution inspired by the BLACK+DECKER “Your Big Finish” initiative! Originally published November 2014. Updated November 2018. You have a CHRISTMAS SHED, Colleen? That sounds awesome. Of course, I’m picturing a gingerbread cottage looking shed that looks like Santa’s workshop… Please tell me it’s that magical! YOu guys, these turned out great! Such a smart use of space. It turned out awesome!! We need to do this too! Trust me, Michelle! You’ll be so glad you did. It really makes good use of what’s otherwise wasted space. Thanks for stopping by to check out our project. Great idea. 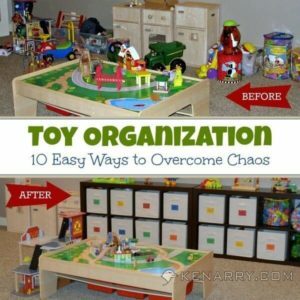 I may have to try something like this, since I’m always running out of storage space. Plus, I love building stuff for the garage out of beefy 2×4’s. Nice work! Thanks, John! Just look to the ceiling – there’s often tons of unused space waiting to be used! Fabulous job, guys! My garage is screaming for some of these. Now we have an awesome tutorial to guide us! Wow y’all did a great job! This is exactly what we need because our garage is stacked to the brim with stuff, and we have hardly any precious floor space. Thanks for the great tutorial, too! Thanks Ashlyn! It’s one of those projects we’ve been meaning to do for years and are so glad we finally did it! What an amazing idea! Incredibly practical and versatile, and also an awesome space saver. I love it. 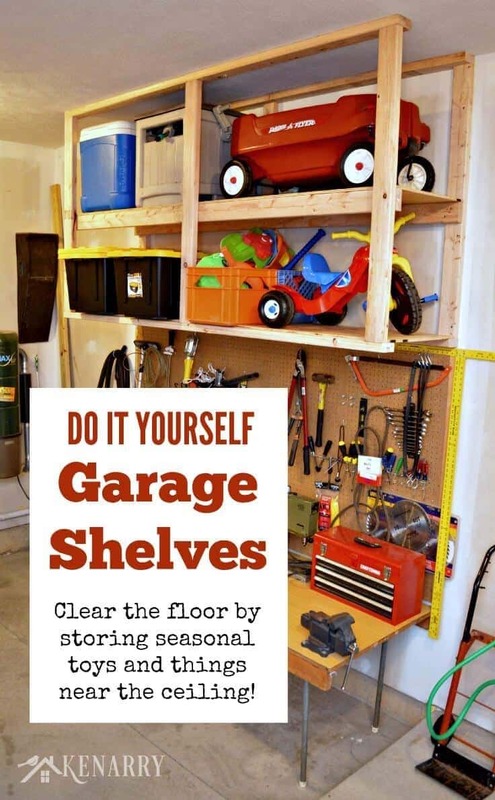 I will definitely add some of these storage shelves on my garage. Thank you! Thanks Viola! We hope they help with organizing your garage. i think plywood sheet of 3/4 inch would be more preferrable to avoid sagging for heavier stuff. The houses in my country are usually constructed with concrete ceiling and brick wall, so we use anchor bolt rather than lag screw to attach things to the house structure. Nice job. Thanks for the comment Tony! I haven’t had any issues with sagging thus far, but agree that the 3/4″ plywood would be more robust. I also appreciate your insight on anchoring into concrete and brick!